So. Where to start? Perhaps, as with most stories, it's best to start at the beginning. The best part of four years ago, a few of us were guests of the Bremont Watch Company and Martin-Baker at Farnborough. Sarah was wearing a BC-S2 on green leather - a watch that hadn't received a great deal of attention from Forum members. However, this sparked off a series of discussions, largely between Al, StampeSV4 and myself, about the watch: it was deemed to be "under the radar" and "the Bremont to have". It was also about this time that StampeSV4 suggested that it might look good with a black DLC / PVD case. 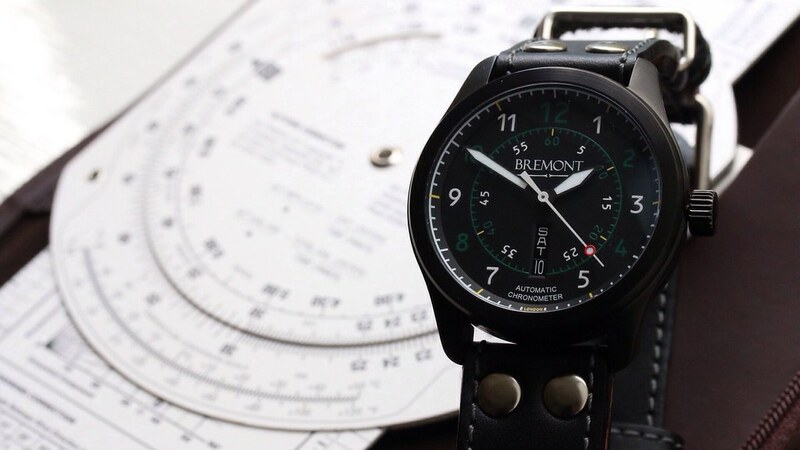 Some of us had been saying since the beginning that the black/green BC-S2 was the Bremont watch that was most like the clocks and dials we so admired in, for example, the Spitfire, Sea Fury, P-51 and Hurricane cockpits. So when Al announced that he was embarking on a second collaboration with Bremont - the MB1.5 being the first - I jumped on board. Fast forward to yesterday, when I finally received a text from Al saying that my ATG SE was on the way. Must say, I'm rather pleased with it. And they do say that the best things come to those who wait...! So the Green Brothers have been celebrating their new additions. The ATG S2 is everything we were hoping for. The black case and month/date marker and larger sword hands really make this a genuine improvement on the original base model. I am also really happy with the made in 'London' location.